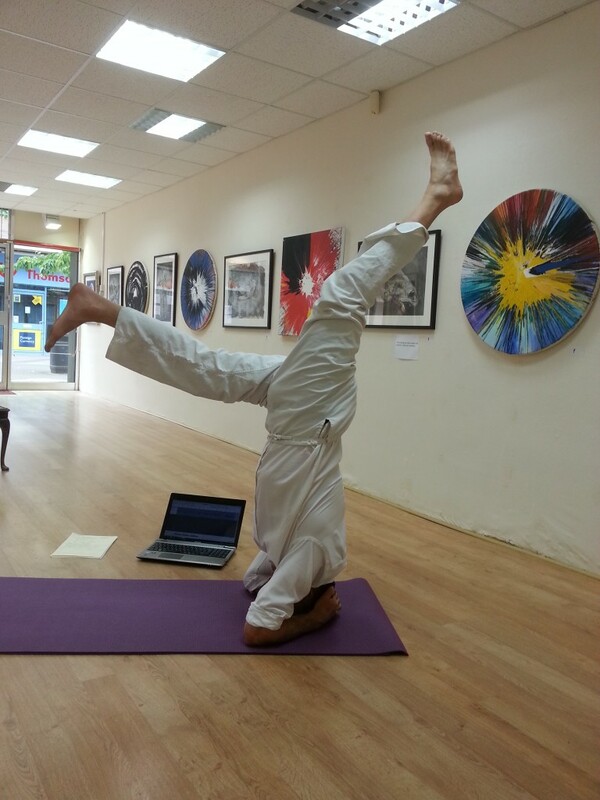 Gallery Dedman in Nailsea hosted the World’s first ‘Head-stand lecture’ during which British artist Alan Dedman presented a stream of consciousness narration whilst performing the Hatha Yoga asana, better known as the head-stand or Sirsasana. All words and thoughts were formulated in a completely upside down way. This talk looked at the reasons why we do art and yoga, comparing therapeutic aspects of each. Similarities and differences between the two were juxtaposed. Looking at how trauma is contained through chronic muscular tension, the way yoga and stretching can release this tension and begin to effect healing. Alan related this to the power of Art as a means of self-expression. Participants thought about the way physical relaxation can alter mental states. The concepts of ego and non-ego were talked about. This was expanded upon by considering how we interact when we use the roads (cyclists and motorists for example) compared with highways in India and Nepal. The talk looked at how our ego’s are bound up with material possessions, poking fun at Mahatma Gandhi’s involvement with funding from business. The concept of societal order was considered. Alan Dedman elicited a ‘social pyramid’ from his audience before moving into Sirsasana – symbolising a Nietszchean overturning of establishment values. During ‘the Head-stand lecture’ Alan created a stream of consciousness, describing the process of Sirsasana and how it feels to go through the pose. The counter pose, Ustrasana (Camel) was performed. He presented Art historical material to point up the issue of revolt and revolution, citing works by Millais and Courbet. Conversation was directed to look at Yoga and Hindu philosophy related to the West, Christianity and Worldwide reaction to yoga in general. Attendees contributed with anecdote from their own experience.